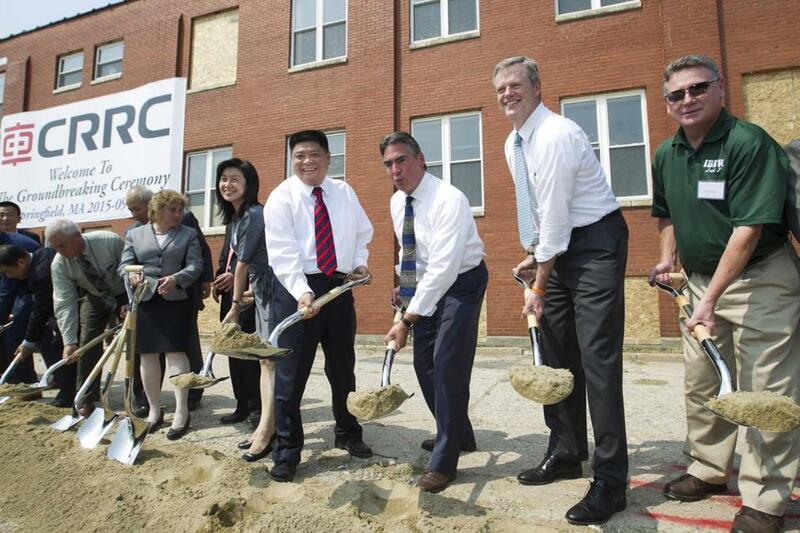 From right to left, Dan D&apos;Alma, of the Pioneer Valley Building and Construction Trades Council, Massachusetts Governor Charlie Baker, Springfield Mayor Domenic Sarno, and CRRC Corporation Limited Vice President Weiping Yu ceremonially break ground for the CRRC USA Rail Corp. railcar manufacturing plant in Springfield on September 3, 2015. New York’s aging subway system is an irresistible draw for Yu Weiping, vice president of CRRC Corp., China’s biggest maker of railway equipment, who says he rides it every time he visits. CRRC plans to double overseas contracted sales to as much as $15 billion in the next five years, Yu said. He last week attended the ground-breaking ceremony for the company’s planned 150,000-square-foot (13,940-square-meter) plant in Springfield, Mass., that will assemble new cars for Boston’s subway. CSR Corp. and China CNR Corp., the nation’s two state-owned trainmakers, combined in May to form CRRC, which competes with Germany’s Siemens AG and France’s Alstom SA for rail contracts worldwide. China’s government in March identified rail as one of 10 focus industries in a blueprint to transform China into an advanced industrialized economy, and has used rail companies to project political influence abroad in addition to winning major orders. China had built more than 10,500 miles of high speed railway networks by July, according to the official Xinhua News Agency. It also has been targeting emerging markets in Africa, Latin America and Southeast Asia -- often with sales pitches from Premier Li Keqiang-- as it seeks to project influence in developing economies. Predominantly focused on the local market, Beijing-based CRRC is beginning to expand overseas. The company generated 88 percent of sales domestically in the first half of the year, according to a statement last month. Its revenue from mainland China increased 0.9 percent, as sales in overseas markets jumped 61 percent. Yu said he spends two-thirds of his time annually abroad looking for deals, as CRRC seeks to go global, and said the Springfield plant is a showcase for the company’s US expansion. The trainmaker is in touch with additional US cities with subway-building plans, Yu said, declining to elaborate. The $567 million Boston deal that CNR won before the merger last year was China’s first major rail contract in North America, and was 50 percent cheaper than Bombardier Inc.’s bid. CRRC last month reported a profit equivalent to $737 million for the six months ended June, its first financial report since the merger. Revenue was $14.6 billion. Its closing share price on Thursday in Hong Kong gave the company a market value of $53 billion. The US market for high-speed rail seemed primed to grow in 2009 when President Barack Obama unveiled a plan to build 10 high-speed rail corridors financed with stimulus funds. Work slowed when Republicans took control of Congress and blocked further federal financing. Yu said he’s nonetheless optimistic about the company’s US expansion plans.